The stunning debut album from this remarkable band whose influences would spread far and wide (Billy Joel, Joe Jackson, by his own admittance, and Elton John to name but three). In an age of "glam" stars and instantly recognisable rockers, what was notable was that they two main founders of Steely Dan, Donald Fagen and Walter Becker were largely faceless, not recognisable to many, even if they knew the music. It was all about the music - immaculately played stuff fusing jazz, rock, Latin rhythms, funk and soul into an invigorating brew of virtual perfection, and the lyrics - obscure, oblique, unfathomable at times. 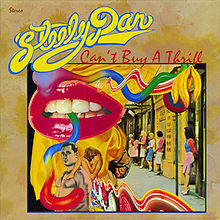 There really was nothing around like Steely Dan at the time. The were truly quite ground-breaking. Those afore-mentioned addictive Latin rhythms hasten in "Do It Again", an irresistible groove that became a big hit. 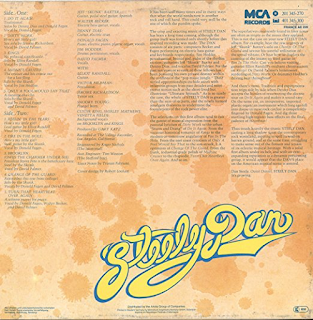 The album version is the superior one, containing a Doors-style organ solo which did not appear on the single. The bossa nova intro is extended too, which is a good thing. "Dirty Work" is sung by vocalist David Palmer, who only appeared on this one album. His voice is less unique and higher, maybe even weedier, than Donald Fagen's. However, this song is not unduly adversely affected. A tale of an extra-marital affair full of introspective self-loathing. "Kings" is a catchy rocking number referencing "the last of good King Richard" - Richard Nixon, maybe? Who "King John" was is unclear. Kennedy? As with all Steely Dan lyrics nobody really knows. "Midnite Cruiser" is sung, convincingly, by drummer Jim Hodder and featuring some killer lead guitar from Jeff "Skunk" Baxter, this is an alluring song with the usual perplexing lyrics and catchy refrain. "Only A Fool Would Say That" is a melodic, summery groove with hints of the material Billy Joel would put out later in the 70s. The quality of the material on this album is so high that this is one of the songs that gets a little forgotten, which is a little unfortunate. It has great vocals from both Fagen and Palmer and some lovely light guitar. "Reelin' In The Years" is a song well known to many. Where to start? That piano bit just before the verses kick in, the guitar parts between verses, the Elliott Randall solo half way through that Led Zeppelin's Jimmy Page said was his favourite of all time, the harmonious chorus, the crystal clear, razor sharp percussion, the intriguing lyrics - just who is it they are referring too? Who had said they were a genius since they were seventeen? I am running out of superlatives to describe this gem. On "Fire In The Hole", for a brief couple of seconds, as the piano starts this song, I think it is Mott The Hoople's "All The Way From Memphis" but then the metronomic, trustworthy groove sets in to this rather sad-sounding song. Some great jazzy piano half way through and another that shows where Billy Joel got his inspiration from. Some nice guitar to finish it off. "Brooklyn (Owes The Charmer Under Me)" sees David Palmer on vocals again in this New York song (I find this far more of a New York album than a Californian one) and he does a good job too, sounding rather like The Eagles would sound over the next few years. Yet another impossibly inviting refrain. This whole album just seeps into the bloodstream like some sort of pick me up. You an never really get tired of it, even all these years later. So ahead of its time too. Once more though, just what was this song about? "Change Of The Guard" has a jaunty keyboard intro, some crisp percussion and we are into another tempting slice of Dan pie. Singalong "la-la-la" parts and a light, sunny day feeling is all over this. There is still time for a searing guitar to cut into things half way through though. "Turn That Heartbeat Over Again" is the album's final song. "Oh Michael, Oh Jesus" is the mystifying refrain on this enticing number, as Fagen, Palmer and Becker all join in on vocals. "This highway runs from Paraguay" - so many interesting lyrics and a smooth, relaxing ambience prevail throughout. A thoroughly solid end to what is an outstanding album.